Every garden should have some water. The main thing is to decide what you want from it. There are so many options to choose from. Do you want the noise of water tumbling from a fountain, the cool serenity of still water, the sight of it flowing, or even an atmospheric mist? However, when you have dogs around there are a lot more things to think about. I’m sure many of you, like me, have dogs that enjoy swimming or even paddling. 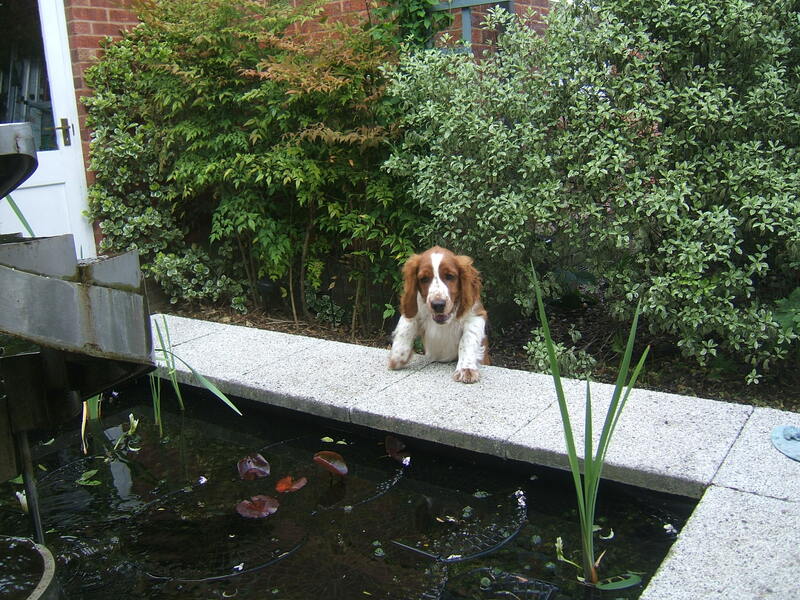 I’ll never forget a visit to a friend’s house which resulted in my puppy taking a swim in her pond. The fish and frogs survived and the puppy was unscathed, just a little wet. But it brought home to me how much more careful a dog owner has to be about how they have water in the garden. For ground level ponds, the option is mainly between the informal and the formal. If you want a classic ground level wildlife pond with sloping sides to help wildlife get in and out, then you will probably have to make a few compromises. You could put a fence around the pond and therefore avoid the possibility of the dogs getting into the water. I have seen some very elegant formal pools designed with balustrades around them (not necessarily because of dogs). These would allow you to have ground level water that dogs can’t reach, assuming the spacing is small enough to stop your breed of dog getting between the columns. Remember, swimming pools fall into this ground level category. Even if you have a cover on a pool, dogs can manage to get under it and might get harmed. Rills and water pavements could be an answer if you want ground level water. Here, there is only a small gap between the hard landscaping through which the water flows. The size of your dog is probably the deciding factor as to whether or not ground level water is a practical alternative for you. The other main option for a pond is to have a raised one. The fact that the water is raised above ground level does provide a natural barrier, and this is what I opted for. Two of my dogs have taken no notice of the pond at all, however, the youngest has been seen to jump up on the surround and walk around the pond. She also seemed to like to take a bite out of the leaves of a water lily, which thankfully did not appear to harm her. Every time we caught her, we told her that this was not acceptable behaviour and she now either has got the message, or maybe does it when we are not around to see! Either way, she has not come in wet, so does not appear to have swum in the pond and we are no longer finding water lilies with tell tale bite marks. 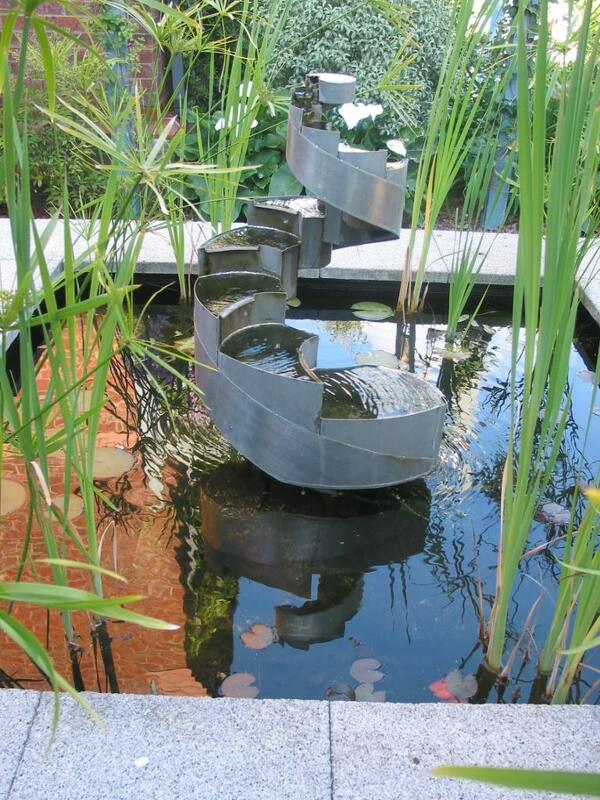 A variation on the theme of a raised pond is the water barrel which allows you to have a small fountain or some plants. Again, the size of your dog may be the deciding feature here, the larger the dog the less likely the height is to work as a barrier and the more likely they may be to drink out of it. If you don’t want flat water, then what other options are there? Well, nowadays there are a wide variety of water features where water spills out of some receptacle. The water is stored underground and stones cover the ground around the feature so that the water can get back to the tank. I have found these to be very dog friendly. You may find that your dogs use it as water fountain, but provided you don’t use chemicals in the water, this will not be harmful to them. Another option is a self contained wall fountain. This creates sound and movement and since it is mounted above ground level can be positioned at an appropriate height to ensure that your dogs can’t get access to it. You can select from a wide variety of interesting designs or sculpture. One of the biggest problems with water is keeping it clear, particularly from blanket weed. Thankfully there are a number of dog safe methods of doing this. Physical removal of blanket weed is obviously the safest, but a number of products based on barley straw are available to help. You can just put barley straw into the pond, in some form of netting to keep it together, or buy liquid products which contain barley straw to add to the water. So long as you are diligent and act as soon as you see the problem, the blanket weed shouldn’t last long. If you don’t want water in its normal forms, then there is still an option available to you. How about creating an atmosphere of mystery in your garden? You can now buy mist machines that spray out a “fog” of water. You will have no pond for your dog to swim in or drink out of, but you may have them coming in a bit damp on those occasions they venture into that part of the garden. This is unlikely to be nothing worse than being out in a shower of rain. If they are like my dogs, they will not choose to be in it for too long if possible. Whatever form of water you choose, please take extra care with puppies. They have so much to learn about the world and love to explore everything. When you first introduce the water feature, you will have to increase your vigilance to keep them safe. So, having dogs does not preclude you from having water in your garden. Yes, you will have to think a little more carefully that most gardeners, and think about your dogs and their needs, but the thought will be so worthwhile. You will have the pleasure of an added dimension to the garden – can’t you just imagine yourself relaxing in it after a day out with your dog.